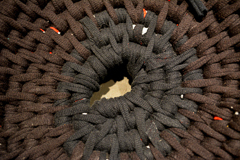 This course will explore the t-shirt as a natural resource for generating functional objects. 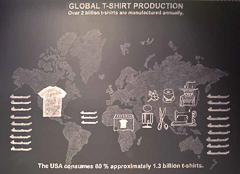 Through lectures, readings, and discussions we will explore systems of t-shirt production, consumption, and remake. Through narratives and story-telling we will learn the history of “make do” along with traditional textile crafts of the region. Simultaneously we will learn the skills of rag rug making, basket weaving, tapestry weaving, broom making, spinning, and rope making, to generate objects based on student’s concepts and interests. Carole Frances Lung is a soft guerilla activist, artist, and academic living in Long Beach, CA. Through her alter ego Frau Fiber, Carole utilizes a hybrid of playful activism, cultural criticism, research, and spirited crafting of one of a kind garment production performances investigating the human cost of mass production and consumption, addressing issues of value and time, through the thoroughly hand-made construction and salvaging of garments. 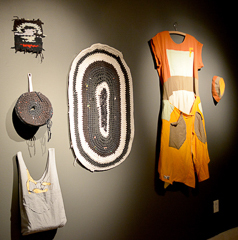 Her performances have been exhibited at Los Angeles Municipal Gallery, Craft in America Study Center, Maloof Foundation, Jane Addams Hull House Museum, Craft and Folk Art Museum, Center for Craft Creativity and Design, Museum of Contemporary Craft, Ben Maltz Gallery, OTIS College of Art and Design, Catherine Smith Gallery, Appalachian State University, and the Ghetto Biennale Port Au Prince Haiti. Publications include: KCET Artbound, Surface Design Journal, Chicago Arts News, American Craft Council: Shaping the Future of Craft, Art in America, and Art Papers. She has lectured at Bauhaus University in Weimar Germany, The School of Art and Design Oslo, Norway, and Museum of Contemporary Art Denver. She has taught classes and workshops at Arrowmont, Haystack Mountain School of Craft, and Penland School of Craft. She has been awarded a Kohler Arts and Industry Residency, a Craft Creativity and Design Center Grant, a CSULA creative leave (2014), a creative mini grant (2013 and 2014), and nominated for the Louis Comfort Tiffany award, At the Edge Gallery 400 award, and Fred A. Hillbruner Artist Book Fellowship. Carole is an Associate Professor at California State University Los Angeles where she was recently named a Fellow for the Public Good, and she maintains the Institute for Labor Generosity Workers and Uniforms, Frau Fiber’s headquarters and experimental factory in downtown Long Beach. 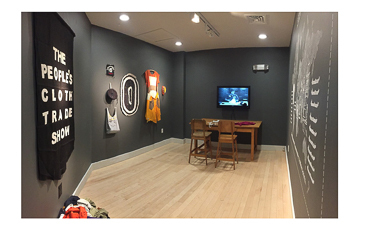 My creative practice implements the visual and written vocabulary of fashion and textile design, production, and consumption, generating installations, performances, and social sculpture, paying homage through a feminist lens to textile and apparel manufacturing histories and contemporary systems. I engage in a practice of careful listening, problem solving, skill sharing, and community building. Viewers and participants are engaged in hands-on experiences, which attempt to instigate change through public interventions, conversations, and community projects. In 2006 I developed the character Frau Fiber, a former East German Garment worker, whose textile job was lost with the fall of the Berlin Wall. Frau Fiber and I have parallel life experiences, in different parts of the world. I am her biographer / archivist, and she is the front person for the work we do. Frau Fiber represents the Lost Generation of workers who failed to assimilate to the new united Germany and never had the economic success of the communist times. Embodied in the uniforms she wears and context in which she appears, Frau Fiber transformed herself into a textile activist, drawing attention to the labor behind the label of the garments we wear. Her work is grounded in generosity, commemoration, and gestures of work. Frau Fiber’s projects, such as Knock Off Production, The Sewing Rebellion, Made in Haiti, Free Zone Regime, and the Institute 4 Labor Generosity Workers & Uniforms, deliberately expose the time, process, and labor that garment production requires. These projects use skills sharing and sewing instruction to foster micro-economies and provide an alternative to the global garment industry, asking participants to exchange their leisure time for production and mending of one’s own textile and apparel goods. Frau Fiber reveals the collaborative aspects of piecework and its ability to help create social bonds. These works are firmly connected to historical instances of organized labor and are a vehicle to think about self-sufficiency, self-empowerment, communal experience, and happiness in work, as well as a tool for fighting poverty and oppression.